Hepatitis B virus, abbreviated HBV, is a species of the genus Orthohepadnavirus, which is likewise a part of the Hepadnaviridae family of viruses. HBV causes the disease hepatitis B. As far as known, HBV is only susceptible to infect human beings and primates, causing hepatitis B disease. Hepatitis B virus has been found by Dana in 1965. 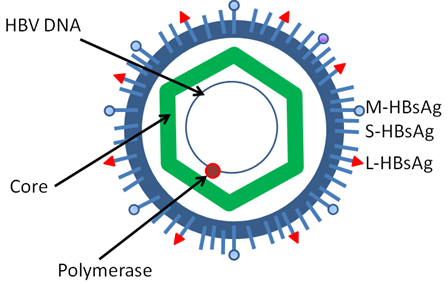 The diameter of this virus is 42 nm and viral particle contains two parts, named shell and core. There are eight known genotypes labeled A through H.
Type F which diverges from the other genomes by 14% is the most divergent type known. Type A is prevalent in Europe, Africa and South-east Asia, including the Philippines. Type B and C are predominant in Asia; type D is common in the Mediterranean area, the Middle East and India. Type A has two subtypes: Aa (A1) in Africa/Asia and the Philippines and Ae (A2) in Europe/United States. Type B has two distinct geographical distributions: Bj/B1 ('j'—Japan) and Ba/B2 ('a'—Asia). Type Ba has been further subdivided into four clades (B2–B4). Type C has two geographically subtypes: Cs (C1) in South-east Asia and Ce (C2) in East Asia. The C subtypes have been divided into five clades (C1–C5). A sixth clade (C6) has been described in the Philippines but only in one isolate to date. Type C1 is associated with Vietnam, Myanmar and Thailand; type C2 with Japan, Korea and China; type C3 with New Caledonia and Polynesia; C4 with Australia; and C5 with the Philippines. A further subtype has been described in Papua, Indonesia. Type D has been divided into 7 subtypes (D1–D7). Type E is localized in sub-Saharan Africa; type F (or H) is restricted to Central and South America. The E and F strains appear to have originated in aboriginal populations of Africa and the New World, respectively. Type F has been subdivided into 4 subtypes (F1–F4). F1 has been further divided into 1a and 1b. In Venezuela subtypes F1, F2, and F3 are found in East and West Amerindians. Among South Amerindians only F3 was found. Subtypes Ia, III, and IV exhibit a restricted geographic distribution (Central America, the North and the South of South America respectively) while clades Ib and II are found in all the Americas except in the Northern South America and North America respectively. Welcome to contact our customer service to get a quotation if you are in need of high quality HBV Core Antigens, HBV Surface Antigens, HBV E Antigens and different subtypes of HBV antigens.